The Cradleboard Teaching Project is dedicated to providing all students and teachers with accurate, enriching Native American Core Curriculum and supplementary materials. Subscribers to our Electronic Powwow are not partnered, but can interact informally with other classes via chat rooms and discussion boards. Experienced Cradleboard classes can apply for our Partnering Program, which involves a commitment to your partner class far away. Whenever possible we bring the Native American studies experience to life, reinforcing the curriculum with opportunities to build live and interactive cross-cultural friendships. For Cradleboard teachers who have spent at least one year in the Electric Powwow model using the general discussion boards and chat rooms and do want to be part of an interactive partnership with a peer class far away, we offer Cradleboard Partnering. Since 1997, Native American classes in Mohawk, Cree, Ojibwe, Quinault, Menominee, Chippewa, Coeur d’Alene, Navajo, Apache, Siberian Yupik, and Hawaiian communities have interacted with same grade classes in the states of Minnesota, Michigan, New Mexico, Arizona, Montana, Washington, Pennsylvania, New York, New Jersey, Wisconsin, Hawaii, Idaho, and Washington, D.C..
For these veteran Cradleboard Partners, we build a custom website exclusive for the use of the two partnering classes. The partnering teachers receive an online binder of materials which include guidelines, calendar, suggested schedules of interactivity, new curriculum, and other information to help the teachers to get to know one another, and to plan and enfold Cradleboard activities into their existing school calendars. Although we suggest schedules of interactivity, it’s totally up to the two teachers what they do and when they do it. Partnering Cradleboard classes also receive everything that’s offered in the Electronic Powwow, and of course all the curriculum, supplements and other resources found at the public area of our website. Cradleboard Partners are kept apprised of Cradleboard Presentations, Cradleboard Conferences, and Cradleboard 101 Teacher Training Workshops throughout the year. To help the two classes and teachers to get acquainted, we have designed preparation activities. Partnering students make self-identity videos, and exchange culture-based lists of questions and answers, and local materials. The idea is to help students to self identify, and also to appreciate their partner’s cultures. Before the partners ever meet, they prepare lists of 20 questions about their partner and 20 statements about what they would like others to know about themselves. Individual students create a personal resume and post it with a small photo of themselves in the discussion area so that others reading the message can see the person who posted it. After completing preparation activities, the partners finally “meet” via Cradleboard’s private custom conferencing environment. They engage in email exchanges, discussions, chat rooms, and sometimes video conferencing and get to know one another over self-designated periods of interaction. Partnering classes are also encouraged to go online via the Cradleboard Teaching Project website and to do projects together which involve internet research. Some classes create Study Buddy relationships and pool their findings. Several of our Cradleboard classes have even gone to visit one another over a period of days at their respective schools. In some cases, the Native American partner community creates tribal specific curriculum materials for the use of their partner class and other Cradleboard classes. 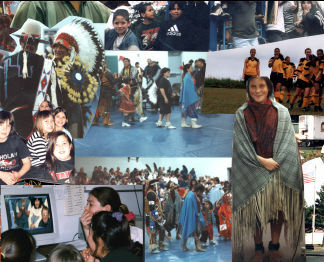 If you have already enjoyed at least one year in our Electronic Powwow model of the Cradleboard Teaching Project, and wish commit to an interactive study partnership with another dedicated Cradleboard class within your own exclusive area of the website, please send us a message at info@cradleboard.org and put Cradleboard Partnering in the subject line of your message. Teachers can elect to create Study Buddies: one student from your school, the other student from your partner school. Draw names to determine who will be your Study Buddy. Partnering classes are also encouraged to go online via the Cradleboard Teaching Project website and to do projects together which involve internet research. These activities can be used as class-to-class team activities, with teachers dividing the work appropriately between the two classes. Do online research via the Cradleboard website Remote Resources and Other Native Sites to create a Web Tour of Indian country featuring websites that provide information on a topic of your choice. Choose from: Native American scientists, writers, entertainers, foods, herbal medicines, controversial mascots, treaties, or make up your own subject with your partner. Bookmark the sites you choose and share the URLs with your partner in our conferencing environment. When all sites have been viewed by both partners, make a date with your partner for a Live Chat discussion session which you copy and post in our Powwow Grounds for all Cradleboarders to see and share. Share your favorite URLs from Native American related sites with your partner class. Give the sites Ratings from The Best - any that deserve four feathers - to The Rest, who receive fewer feathers in your opinion. As if you are a jury, talk them over with your partner to see where you agree and disagree about the value of a site. Post your combined results in the Powwow Grounds. Do research together on a certain tribe - your own or another. Divide up the work: Team One does history, maps, contemporary life, sports. Team Two does government, survival skills, traditional daily life, and music/dance. If you have a scanner, assemble scanned pictures and text and send them as email attachments to your partner. Otherwise make copies of pictures and text and snail mail them to your partner. When the exchange is finished, each partner class will have a complete set of data from which to create a final report you can present to your school. The Cradleboard Teaching Project exists because educators want more enriching, accurate Native American material in all schools. We encourage non-Indian students and teachers not to be shy, but to ask anything they really want to know about Native American people and culture. That’s how we can overcome ignorance together. Students ask things like: Do you live in tipis? Have you ever seen a real Indian tipi? Can you vote? Are you angry at the United States? Do you smoke pot in those peace pipes? What things are important to you? What kind of music do you like? Do you think of yourselves as your tribe or Indians or Americans? Here are some of the questions that the students in Ms. Robert’s grade three class at Salmon River Central in New York sent to Tahola Tribal School in the state of Washington before they had met. Does your tribe have clans? Do any of your ceremonies let you dance around a fire? Do you have any Native American toys? - other favorite toys? How many people are on your reservation? Do you see piranhas or sword fish in the ocean near you? What kind of fish do you catch mostly? Do any of you wear traditional clothes? Do you hunt with a bow and arrow? Does your class have spelling tests? Here are some of the statements that Ms. Guge’s class at Tahola Tribal School in Washington state sent to their partner at Salmon River Central in New York before they had met. We live on the Quinault Indian Reservation. Our Reservation is located by the Pacific Ocean on the Olympic peninsula in Washington state. Fifty percent of our population is under age 18. Our main industries are fishing, forestry, and working for the tribe. Our school is creating a Virtual Museum on the internet about artifacts of our culture. We have culture classes 4 days a week. We have a Quinault museum on our reservation. In our woods there are bear, elk, deer, coyote, bobcats, cougars and many small animals. Our reservation borders on the Olympic Rain Forest. It is one of the few temperate rain forests in the world. Here are some more questions that various non-Indian classes asked their Native American partner. Do you live in tipis? Have you ever seen a real Indian tipi? Are you angry at the United States? Do you think of yourselves as your tribe or Indians or Americans?